Home | New Releases | Mian Situ Handsigned and Numbered Limited Edition Masterwork Canvas Giclee:"The Golden Mountain - Arriving San Francisco, 1865"
Mian Situ Handsigned and Numbered Limited Edition Masterwork Canvas Giclee:"The Golden Mountain - Arriving San Francisco, 1865"
About the Art: Covered wagons pulled by oxen and moving the essential belongings of hopeful travelers headed toward the setting sun is the common narrative of the 19th century westward movement. This storyline excludes the immigrant experience of many others who traveled eastward by ship to become undeniable contributors to the building of rail lines, gold mines and elements of commerce from San Francisco to the Black Hills. Artist Mian Situ (born in Canton, China, 1953) gained his formal art training in China and immigrated to the United States in 1987. Since then, he has become a highly regarded artist, devoting his work to portrayals of his rural native land and to expressing much of the Chinese experience in the American West. The Eiteljorg Museum is proud to announce it has acquired one of Situ's best-known works and will feature it in the newly redesigned Western galleries that will reopen in November 2018. The Golden Mountain, Arriving San Francisco, 1865, is six feet high and 60 inches wide. In this 2003 painting, Situ has created a composition embracing a family in the center sunlight, the deck of the ship crowded with tired but hopeful individuals seeking opportunities in a land new to them. When first exhibited at the Autry Museum at its annual Masters of the American West show in 2003, the painting received the Thomas Moran Memorial Award for best painting and both the Artists' Choice and Patrons' Choice awards recognizing its qualities as a significant accomplishment in the field. Now the eastward-moving work will find its permanent home in Indianapolis. The painting significantly adds to our growing holdings that help visitors understand the diverse nature of the art, history and cultures of the West. 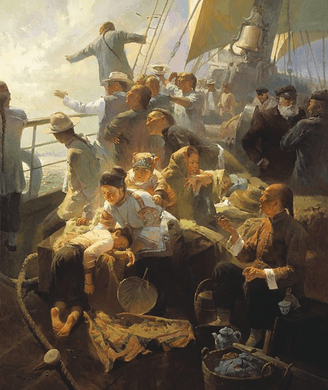 Home | Fine Art Prints & Limited Editions | Greenwich Workshop | Mian Situ | Mian Situ Handsigned and Numbered Limited Edition Masterwork Canvas Giclee:"The Golden Mountain - Arriving San Francisco, 1865"